LASP is committed to making its facilities accessible to all visitors. If you require special arrangements because of a disability, please contact your meeting or event host. 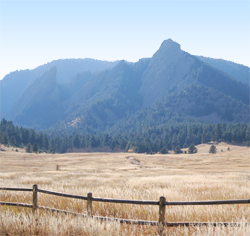 Following is a selection of information concerning Boulder and the surrounding area. For a comprehensive listing of hotels, restaurants, air, shuttle, bus, other transportation options, entertainment, and other information, visit the Boulder Convention and Visitors Bureau website. Note: The following commercial establishments have no official relationship with LASP; LASP implies no endorsement of them. Airport Transportation (PDF)—Airlines, airport, rental cars, ground transportation and maps from DIA. Getting around Boulder (PDF)—Local shuttle buses serving the campuses, the 29th Street Mall and the Pearl Street Mall and Boulder maps. The following are some popular lodging options for visitors to LASP. When you call, ask if they have a special University of Colorado rate; a government rate might be better if you qualify. These hotels, except the Hotel Boulderado, are within about one mile of the LASP Space Technology Building. Best Western Boulder Inn: 770 28th St., 303-449-3800 or 800-233-8469. Less expensive option. Best Western Golden Buff Lodge: 1725 28th St., 303-442-7450 or 800-999-2833. Less expensive option. The Boulder Broker Inn: 30th St & Baseline Rd. 800-338-5407. Mid-range price. Courtyard by Marriott: 4710 Pearl St. East Cir., 303-440-4700. Mid-range price. Embassy Suites by Hilton: 2601 Canyon Blvd., 303-443-2600. An “urban retreat” featuring all suites plus indoor and outdoor event spaces. Mid-range price. Hilton Garden Inn: 2701 Canyon Blvd., 303-443-2200. Embassy Suites “sister” hotel, co-located with shared select amenities. Mid-range price. Homewood Suites by Hilton: 4950 Baseline Rd., 303-499-9922. Residential hotel with the comforts of home including fully equipped kitchens. Mid-range price. Hotel Boulderado: 2115 13th St., 800-433-4344. Right in the heart of downtown Boulder. More expensive. Lazy L Motel:1000 28th St., 303-442-7525 or 800-525-1444. Inexpensive, closest walking distance. Millennium Harvest House Boulder: 1345 28th St. 303-443-3850 or reservations at 866-866-8086. Mid-range price. Residence Inn: 3030 Center Green Dr., 800-228-9290. Residential hotel with the comforts of home including fully equipped kitchens.